The use of pre-wetted alcohol wipes has become commonplace and extremely important in the food processing industry, for a variety of reasons but particularly for hand hygiene. The polypropylene material is approved for food contact areas. 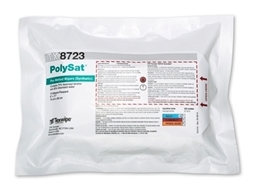 PolySat® (TX8723 or TX8727) incorporates soft, 100% melt-blown polypropylene substrate pre-wetted with a 0.2 µm filtered, 70% isopropyl alcohol/30% deionized water solution. With the inherent softness of the polyproylene, PolySat® wipers are ideal for sensitive surfaces.